Portland architect Lyndon Keck, standing at right, describes possible locations for a vocational center to Washington County school officials during a meeting Monday at Harrington Elementary School. If officials from districts that would partner in the vocational center cannot agree by the end of the month on where it should be located, the state will revoke a $2 million grant it has offered to fund the project. If a group of school districts in coastal Washington County can’t agree in the next couple of weeks on where they want to locate a new vocational education center, they risk losing a $2.1 million grant from the state. The Maine Department of Education awarded the districts the grant in January, and the school systems — located in 10 towns stretching from Milbridge to East Machias — have been looking for an existing building to buy and renovate to house vocational programs including welding, heavy equipment maintenance, automotive repair and early childhood development. The new center would double the array of vocational offerings in a county that had the highest unemployment rate in Maine in January and the highest poverty rate. Some students travel as far as Ellsworth and Bucksport for some vocational offerings that would be available in Washington County at the new center. But the districts first have to agree on a location, likely among two current contenders: a former car dealership in Machias and a former supermarket in Columbia. If the districts don’t agree and they lose the grant, it would be a painful repeat for many of what happened more than a decade ago, when several districts had picked a location in Jonesboro for a proposed career and technical education center. That project, and the associated state funding, was scrapped amid the contentious statewide school district consolidation debate after the districts could not agree on what services they should provide at the site. On Monday evening school and municipal officials from the participating districts met for more than three hours in the gym at Harrington Elementary School to try to reach a consensus on the vocational center’s location. 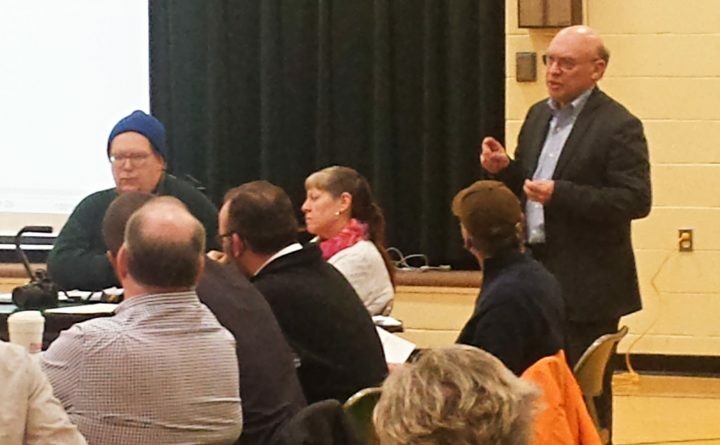 Officials from privately run Washington Academy in East Machias also were at the meeting. The discussion was tense at times as the group talked about the lack of economic opportunities in Washington County, the need for vocational training for area high school students and the merits of different properties evaluated by an architect. Throughout the discussion, the elephant in the room was the possibility that the districts might again squander an opportunity to have the state pay for a facility that many in the economically depressed area have wanted for decades. Fern Desjardins, a retired school superintendent from St. Agatha, served as a mediator. If the districts cannot agree on a site by the end of March, she warned, the Maine Department of Education will almost certainly revoke the $2 million it has agreed to provide for the project. “They have done it and they will do it again,” Desjardins said. Washington County students already have access to some vocational programs, according to SAD 37 Superintendent Ron Ramsay. Machias Memorial High School offers instruction in culinary skills and building trades, while Narraguagus High School in Harrington has law enforcement and certified nursing assistant programs, he said. But a new vocational center would allow the districts to expand their offerings and cut travel distances for students who currently travel to Ellsworth and Bucksport. Out of a dozen properties in central and western Washington County evaluated by Portland architect Lyndon Keck, the choices Monday boiled down to the former Blueberry Ford dealership in Machias, and the former Columbia Supermarket at the Four Corners Shopping Center. The buildings each have more than 11,000 square feet of floor space and have been empty and unused for at least a few years. Neither one is ideal, said Keck, who attended Monday’s meeting, but each could be acquired and renovated for about $1 million, which likely would give a vocational center at either site a lifespan of about 10 to 15 years. That might be enough time for the state to approve, plan and construct a brand-new, higher-quality vocational center for the region, possibly at a different location. The cost of a brand-new facility would be in the tens of millions of dollars, Keck said, and would have to be built with state funds, if the state might one day be willing to support one. As for the current options, the former dealership has access to public water and sewer, while the former supermarket property has a larger parking lot, the architect said. Kimberly Look, who owns the supermarket property with her husband and brother, implored the gathered school officials to agree on a site. She said she’s been approached by people interested in opening a thrift shop or a food pantry at the former grocery store, but that she would prefer to see it used in a way that actually helps to reduce the region’s endemic poverty. For that reason, she said, she is willing to sell the 6-acre property for $165,000, the outstanding balance on the owners’ mortgage. But the most important thing, she said, is for the districts to agree on a site, even if it is not the one she owns. Officials from Cherryfield, Jonesport, Beals and SAD 37 said Monday that their preferred site is the defunct Columbia grocery store. Officials with Machias and others with Washington Academy, however, said they needed more time to consult with their full school boards before they could decide. The full group agreed to meet again at 6 p.m. Thursday, March 21, at Narraguagus High School to see if they can reach a consensus by the end of the month. Correction: An earlier version of this story inaccurately described the scope of towns that would be partners in the grant program. The town of Machias would be a partner in the group but other AOS 96 member towns will not be.